This Faux wood sign comes completely BLANK- you are the designer. Pick a logo/pic and a saying for this sign. Shown is only an example of what a custom made sign might look like. The sign is 16 x 12 inches. 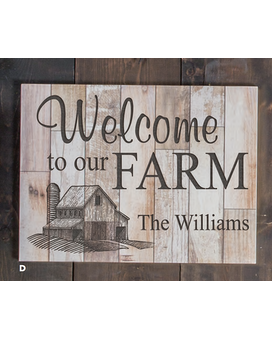 Give us an occasion, a bible verse, and inspirational quote and we'll put it into play on this nice size piece for your wall. Don't forget to make it PERSONAL- it's the BEST part of the gift!